Now that I have completed my review of Man of Steel, I think now is a good time to put together my retrospective of Superman, especially since I am someone who is more familiar with the Superman lore than one should probably admit. 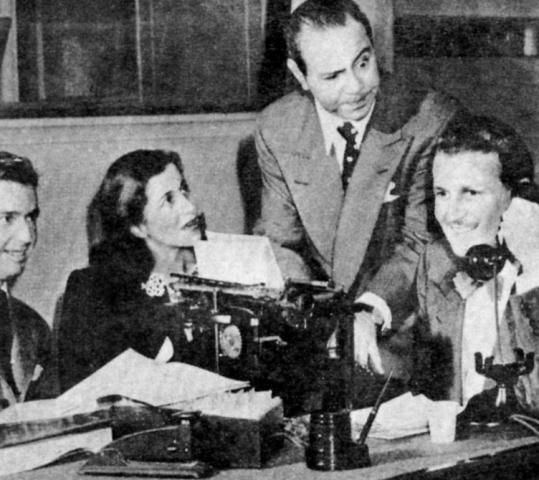 A broadcast session with “Bud” Collyer (on the phone) as Clark Kent/Superman and Joan Alexander as Lois Lane with Jackson Beck (the announcer) banging on a typewriter to provide sound effects. Very soon after Superman’s debut in Action Comics (later DC Comics) magazine, he starred in his own ABC radio serial in 1940. As of when the radio series was written, Kryptonians were shown to have superpowers even on Krypton, which itself was situated in the same solar system as the Earth. As this was also made at a time before man had actually succeeded in space travel, it took Kal-El (aka Superman) so long to get to the Earth that he was already a grown man by the time he arrived. For the most part, Superman fought regular human villains and many stories played out more like detective stories, where Superman had to figure out who was the perpetrator of a crime. During the war years, Superman also fought the Axis powers, helping the US win the war (which does beg the question why the atom bomb was necessary if we had Superman). One of the most memorable stories from the immediate postwar time was that of the Atom Man. The Atom Man was a Nazi with kryptonite (Superman’s one and only weakness) flowing in his veins, and more importantly, one of the first real supervillains Superman had ever fought. Clayton “Bud” Collyer made his debut here as the titular superhero, and he went on to provide what is perhaps the most iconic voice Superman ever had. In fact, I wouldn’t doubt it if Kevin Conroy’s giving Bruce Wayne and Batman different vocal tones was inspired by Collyer’s treatment of Clark Kent and Superman. In addition, Joan Alexander joined the cast as Lois Lane. 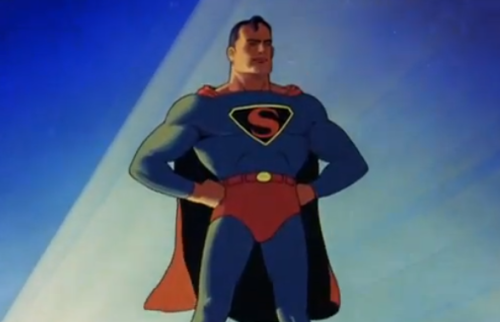 Superman as he appeared in the intro to the Max Flesicher cartoons. Both Collyer and Alexander would provide their voices to their respective characters in the Max Fleischer Superman cartoons. Despite their simplistic stories, these cartoons were known for how lifelike they were as a result of the animation being rotoscoped. Once again, as these cartoons were made during the World War II years, they doubled as pro-America propaganda where Superman battled Nazis and the Japanese, often with very overt racism in the case of the latter (how Japanese characters were drawn and a cartoon entitled “Japoteurs” come to mind). 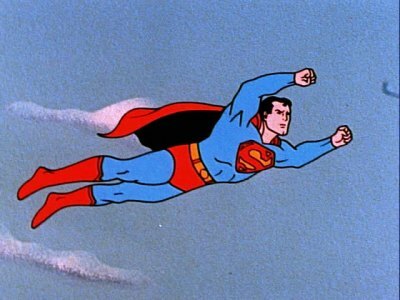 Nonetheless, these cartoons definitely showed Superman’s potential in animated form. Quite a few years after the end of the radio series in 1951, Bud Collyer and Joan Alexander once again reprised their roles in the 1966 animated series, The New Adventures of Superman. Joining Collyer and Alexander in the cast was Jack Grimes, who voiced Sparky in the English dub of Speed Racer, as Jimmy Olsen. The late 1960s was a time when animation studios, now that televised cartoons were a mainstream form of entertainment, were trying to almost literally mass-produce cartoons to put on air. As a result, many of them, The New Adventures of Superman included, suffered in terms of things like animation quality. Despite its popularity, The New Adventures of Superman was canceled in 1970 as a result of pressure from groups like Action for Children’s Television, who thought the show was too violent for something meant for children to see. However, it was not long before Superman made his debut on the big screen. Superman: The Movie hit theaters in 1978, and it was absolutely nothing like what the moviegoing public had seen before. Director Richard Donner had done what many considered impossible, and that is bringing Superman and his powers to life in a story that adults could appreciate. Superman featured special effects that were easily on par with Star Wars, which was released the previous year. More importantly, it had an absolutely superb cast, namely fellow Cornell alumnus Christopher Reeve as Clark Kent/Superman. While Bud Collyer is the most iconic voice actor Superman ever had, Reeve is easily the most iconic screen actor Superman ever had. 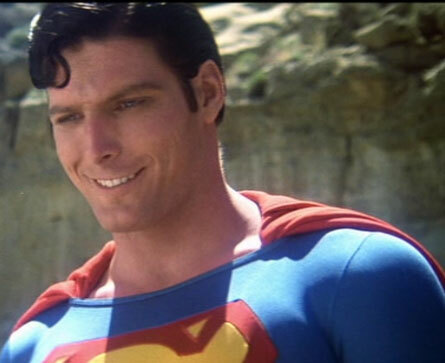 Despite the fact that he was already suffering from alopecia, Christopher Reeve was undoubtedly a very handsome man who actually legitimately looked the part. Starring opposite him were Gene Hackman as archnemesis Lex Luthor and Marlon Brando, in a 15-minute cameo (for which he was payed $4 million), as Jor-El. Margot Kidder as Lois Lane. What really sealed the movie to me, however, was Margot Kidder as Lois Lane. In 1978, Margot Kidder was a very beautiful woman. More than that though, she managed to really add the quirks to Lois’ character that made her completely impossible to forget. Unfortunately, Superman, like many other movies that were made around that time, suffered exactly the same problem that came with being very successful. That is Superman had far too many sequels. Superman II (1981) was still a reasonably good movie as it featured the Man of Steel facing three Kryptonian supervillains, led by General Zod (Terence Stamp). Superman II was actually largely filmed at the same time as the first movie, and also largely directed by Richard Donner. However, due to a disagreement with producers Alexander and Ilya Salkind, Richard Donner was dropped from the director’s chair and Richard Lester, veteran of the Beatles’ films A Hard Day’s Night and Help!, took over to finish Superman II and direct all of Superman III. Superman III (1983) was written more or less as a comedy that doubled as a vehicle for Richard Pryor. Margot Kidder, as a result of her disagreeing with Donner’s dismissal, had her role shrunk down to a cameo with Annette O’Toole brought in as Lana Lang to sort of be a temporary love interest for Superman. The movie’s plot basically involved Superman battling Ross Webster (Robert Vaughn), a CEO of a software company hellbent on taking over the world. Yes, you read that right. A software company CEO trying to take the world over. And Richard Pryor is a programming genius in this movie. I don’t care what anyone says, but Richard Pryor was never funny in my opinion, and he certainly didn’t help Superman III. The Salkinds were trying to take Superman in a more campy direction, already putting a bit of slapstick in Superman II, and that resulted in Superman III basically being the pseudo-comedy that it was. However, it was Superman IV: The Quest for Peace (1987) that made my list of some of the flat out worst movies I have ever seen. By this time, you can see how much older the entire main cast had gotten. 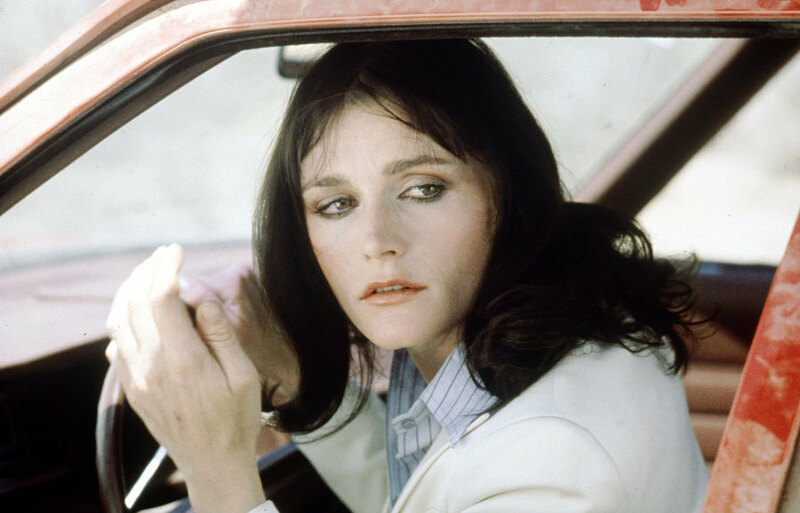 Margot Kidder, again a beauty in 1978, was basically a text book case on how an actress is NOT supposed to age as she looked like a haggard shell of her former self. Even Marc McClure (Jimmy Olsen) looked “grown up”. More than that, the movie’s story was a pathetic attempt to cash in on the issue of the day, which was US-Soviet nuclear disarmament, and it was made on a shoestring budget where the special effects were absolutely laughable. I also just need to say Nuclear Man (Mark Pillow in his first and last role) was basically the worst supervillain ever. It was a miracle that Gene Hackman’s career could survive this catastrophe. 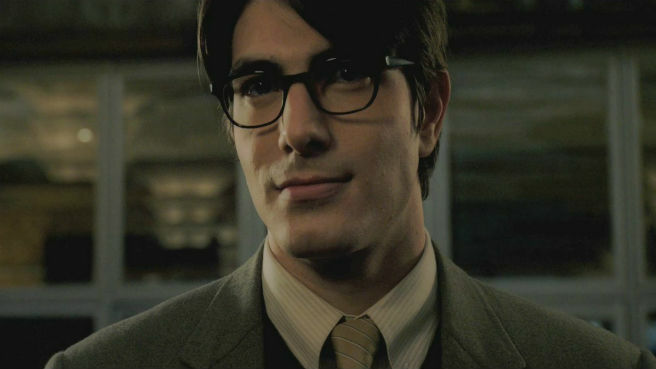 Brandon Routh as Superman in the guise of Clark Kent. After almost 20 years, the series was rebooted in Superman Returns (2006), featuring Brandon Routh as Superman and Kate Bosworth as Lois Lane. The movie was written to basically deem Superman III and IV as non-canon and pick up where Superman II left off; I agree that it is best the world forget Superman III and IV ever happened. That said, I will say I did enjoy Superman Returns, much more so than Man of Steel in fact. Superman Returns, directed by Bryan Singer, featured some absolutely terrific special effects. However, I thought the best part of the movie by and far was Kevin Spacey’s portrayal of Lex Luthor. That said, Brandon Routh’s portrayal of Superman himself was very forgettable; I feel like he was hired almost purely because he kind of looked like Christopher Reeve. I know I missed a very critical part of Superman’s screen history, and that is the television series Lois and Clark: The New Adventures of Superman, which ran in the mid-90s featuring Dean Cain as the only Asian-American to have ever played Superman (say what you want about him being only 1/4 Asian, but George Dean Tanaka always looked suspiciously Asian to me even before I knew he was part Japanese) and Teri Hatcher in her most famous role as Lois Lane. That is entirely because it ended before I turned 6. However, I will be sure to check it out soon enough. If anyone is familiar with the series, feel free to share your two cents on it in the comments below!